Congratulations on finding that special someone to spend the rest of your life with. Your wedding day deserves a captive entrance! Toast the start of your new life as husband and wife while listening to the gentle clip-clop of the horse hooves striking the pavement as you are transported back in time to the splendor of yesteryear. 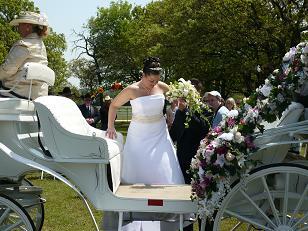 Complete your fantasies of the perfect wedding with a touch of enchantment by a horse drawn carriage. 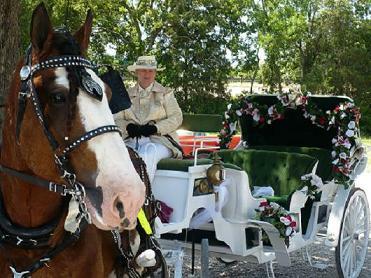 You will treasure a lifetime of photos that can be taken using our immaculate carriages and horses as a backdrop. Be sure to plan ahead with your photographer to stop at scenic spots along the your route. Let us color coordinate with the color of your wedding, by colored silk flowers as well as ivy on your carriage, plus A "Just Married" sign. Your guests will be so surprised to see that extra touch of class of perfection. Our service is surpassed only by the love of what we do, "A life Time of Memories."